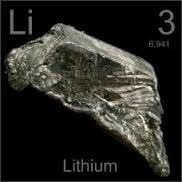 Lithium's atomic number is 3, Its atomic weight is 6.94 and is abbreviated LI. Also It is in period two and family one making it an alkali metal. Its boiling point is 1347.0 C and its melting point is 180.54 C and is solid at room Temperature. Lithium has one valence electron and normally gives it up to form a cation. It has three protons three electrons and four neutrons. Lithium also has two electron shells. Lithium batteries, you'll get a charge out of this one.